If you were ever wondering how do you change "Newsfeed" title when using SiteFeed web part... It is a predefined resource located in profilebrowserscriptres.resx and profilebrowserscriptres.en-US.resx (depends on your locale). While you can tweak it, it is highly not recommended, as changes to Microsoft files, located in 15 HIVE could be overwritten during service pack deployment, migrations, etc. You can change Microsoft.SharePoint assembly reference to 14.0.0.0 or 12.0.0.0 to use it with SharePoint 2010 or SharePoint 2007 respectfully. It used to be a standard practice to use redirect in event receivers in SharePoint 2010 and SharePoint 2007. SharePoint 2013 has some changes in this functionality. No redirect options available for ItemAdded, ItemUpdated and ItemDeleted. Some redirect options available for ItemAdding, ItemUpdating and ItemDeleting. They are only available when the form, which initiates an event, is being rendered in CSRRenderMode.ServerRender mode. Otherwise list forms are committed through asynchronous XmlHttpRequests, and redirect options are not available. SPUtility.Redirect does not work in Event Receivers any more. It actually throws an exception. The reason - SPUtility.Redirect relies on HttpContext.Current, which does not exist at that point of execution. Tested with different CSRRenderMode settings. When using CAML and SPSiteDataQuery, and including a lookup field in ViewFields, you have to make sure this field is used in Query as well (i.e. in OrderBy). Otherwise it would not show up in your result dataset. This happens in SharePoint 2013 (15.0.4420.1017). 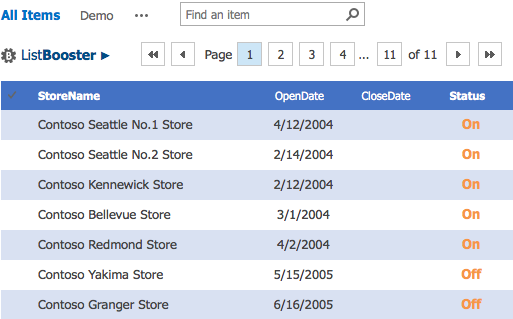 Same query in 2010 and 2007 produces result dataset without the need to include the field in query. Looks like a bug in SharePoint 2013. SharePoint 2013 site definition requires "<!-- _lcid="1033" _version="15.0.4420" _dal="1" -->" to be present in site definition template file (with respect to your regional settings obviously). It would not show up otherwise. It was not a requirement before, so make sure you have it updated/added when migrating your solution from 2007/2010. There have been a very interesting article at SharePoint Developer Support Team Blog. It discusses editMode parameter, and also mentions WPID parameter in the code sample. This got me into researching this matter. So far we had two MSDN articles, discussing tokens: URL strings and tokens in apps for SharePoint and URLs and tokens in SharePoint 2013.
editMode - has two possible values: 1 or 0. 1 means the web part (not Page) is currently in Edit Mode. WPID - represents a WebPart.ID (sample value is "g_f5ac6d08_5b6f_41ea_90d1_0cc8a030061c"). WPQ - represents a WebPart.ClientID (sample value is "ctl00_ctl33_g_f4a94a49_ce63_4c7f_ba05_884b17132672"). WebLocaleId - represents a web.Language.ToString(CultureInfo.InvariantCulture) (sample value is "1033"), which is a Language Id. You can use all those tokens in the URL, the same way as you use custom properties, without the need of adding actual properties. All tokens are case sensitive. LogonUser - represents a context.Request.ServerVariables["LOGON_USER"]. WPR - represents a Web Part Resource Path : (web.Url + "/" + web.TypeCache[type, web.IsAppWeb, false].WebRelativeClassResourcePath). WPSRR - represents a Web Part Server Relative Resource Path : web.GetServerRelativeUrlFromUrl(web.TypeCache[type, web.IsAppWeb, false].WebRelativeClassResourcePath). When working with SPSiteDataQuery keep in mind that all DateTime results are being returned either in current user profile regional settings timezone, or under root web regional settings timezone, depending on the settings. It will ignore all the sub web regional settings.